I wanted to do a quick write up of Seagate's FreeAgent Go 1TB USB drive. I bought it in May 2010 and it stopped working for me over the weekend (October 2010). I'm very careful with my drives as I have a significant amount of photographs and wildlife videos in them. I plugged it in this weekend and I was shocked that it wouldn't read my drive. The power light turned on but I didn't see Windows recognizing the drive. I tried to hear if there was any physical damage and wasn't able to detect the usual audible "clicks" that sometimes occur when your drives crash. I had two choices: attempt to open it myself and fix something, or send it in for repair under Seagate's five year warranty. The problem with the latter choice is that potentially, Seagate would just ship me a new drive and wipe out my old data. That would be a disaster. My hard drive was worth $100 or so, but the data that's in it is priceless. 1. I opened up the top container of the drive with a small screwdriver. It needs to be a small screwdriver, like the ones used for eye glasses. The yellow arrows in the image below shows where the glue is placed so the container would stick. Aside from the glue and a small LED cable, there's nothing else holding the container panel together. 2. 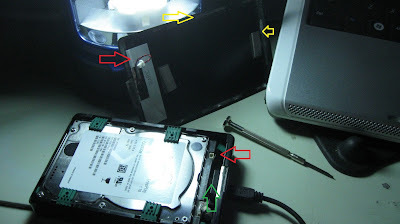 The red arrow shows the LED power cable. Even if you damage it, it won't hurt your data or your hard drive. I originally thought this was something important but all it does is power up the LED lights so that you know the hard drive is turned on when you plug it in. 3. The green arrow shows where the problem was. The power connector / data connector was loose. Every time I plugged it in, the contacts weren't connecting properly. Once I pushed it back in and held it steady a piece of paper folded several times (or you can use foam), the hard drive was readable again. Success! I didn't lose 700 GB of data on my 1TB drive. I have no doubt that by opening this I may have voided my warranty. So be warned if you are thinking about fixing your own hard drive. You have to understand which is more important to you. Will I buy this hard drive again? There's some reviews online from Amazon and other sites that their hard drives of the same models crashed. Some talked about hardware issues like faulty sectors, but I believe some also were affected by this "loose connector" issue. At any rate, now that I know it's a relatively easy fix if this happens to me again, I will continue to buy this model. Overall it is reliable except for that one loose part that can be remedied with one quick fix. Nice, Mine have the same problem, you've given me hope to save my precious data. Thanks a million. This just saved a TB worth of TV documentaries I had save on a Seagate drive.